The Marvel(R) Collectibles Storm Premium Format Figure is available for Amazon. Storm (Ororo Munroe), is one of the founding members of the new X-Men, and first appeared in Giant-Size X-Men #1 (1975). Storm has gone through many changes during her time as an X-Men (recently, she married T’Challa, better known as the Black Panther), but she has always been a prominent member of Marvel’s mutant super team. This beautiful statue has been created by the team at Sideshow Collectibles – Mark Newman (Sculpt), David Fisher (Paint), Gidget Earle (Costume Fabrication) and Thor Badendyck (Design). Storm stands 20″ tall and features a real fabric cape and interchangeable hands offering more display options. 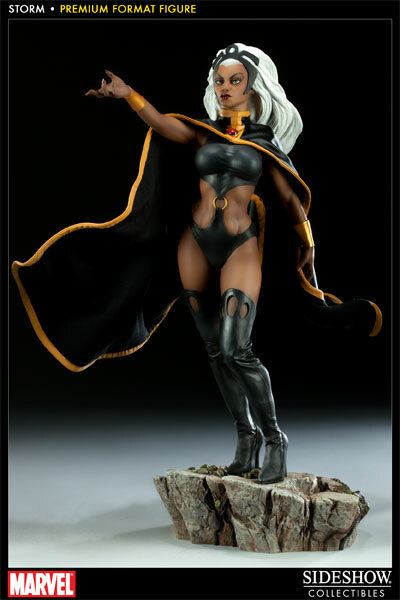 There is also an exclusive Storm figure that features an alternate portrait with white eyes and a fine art print. Ride the clouds over to Amazon and order the Marvel(R) Collectibles Storm Premium Format Figure today!